I was in Birmingham for about a week trying to help my parents out while my father was in the hospital. Dad was released yesterday and I returned to Huntsville to get to a couple of doctors’ appointments of my own and take care of some things before returning to Birmingham this weekend. The big plan for today was to cut my grass and take care of some outdoor chores before going to still another appointment this afternoon. The weather had other plans and my yard has been taking a drenching since late last night. Since I have been away from the house, some of my fresh fruit and produce from the farmers market needed to be chunked. Most distressing was that my most recent basket of Jimmie’s peaches from Chilton County – probably my last Chilton County peach run of the season – was getting too ripe. People tell me to freeze fruit and vegetables and leftovers before they go bad but I know from experience that if I put something in the freezer I might as well just dig a hole in the back yard and bury it: It won’t be touched again until it’s time to dump it. This is true of most people, I find, but they persist in throwing stuff in the freezer only to throw it out a few months later. 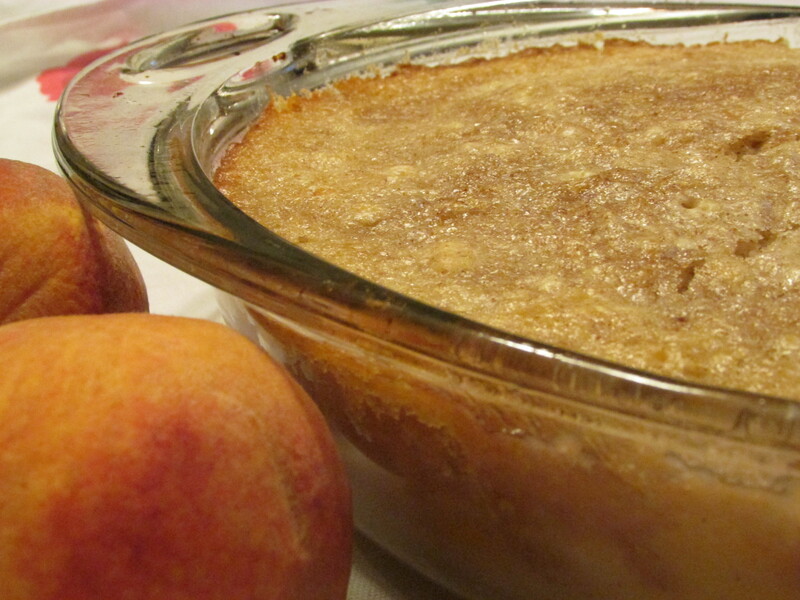 I hate to waste food and I especially hate to waste Chilton County peaches so I decided to make a peach cobbler to salvage a few of the peaches and to take back to my parents in Birmingham – neither of whom seems to be eating regularly or well during all of this sickness. Here’s the quick and easy recipe and, of course, other fruits might be substituted for the peaches according to taste, availability, and preference. Place the stick of butter in a greased 9 inch casserole dish and set the dish in the oven as it preheats, allowing the butter to melt. Mix sugar, milk, cinnamon, lemon juice, and flour in a large mixing bowl. When the butter is melted, remove casserole dish from the oven and carefully pour the batter into the dish. Evenly place the fruit in the batter. Bake for 45 minutes until the top is firm and golden. Let it cool and serve. 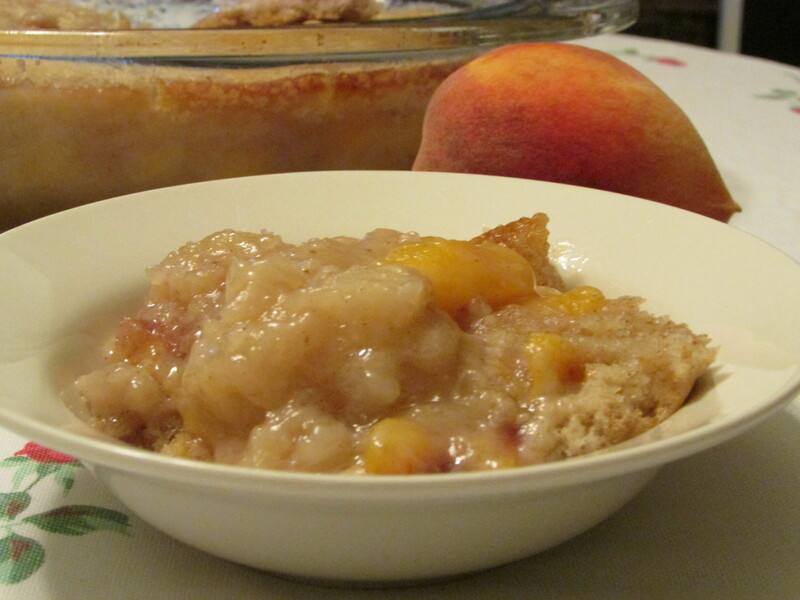 This entry was posted in Peach Cobbler recipe and tagged Chilton County peaches, Jimmie's peaches, peach cobbler on August 6, 2015 by gedwardjourney.